Preview: Missha Longer Name Ampoule and CosRX Returning A-Sol Have Arrived! Aww yiss. After weeks in transit and customs limbo, my little RoseRoseShop parcel has arrived, containing two of the most exciting Korean skin care products I’ve ever gotten my hands on. 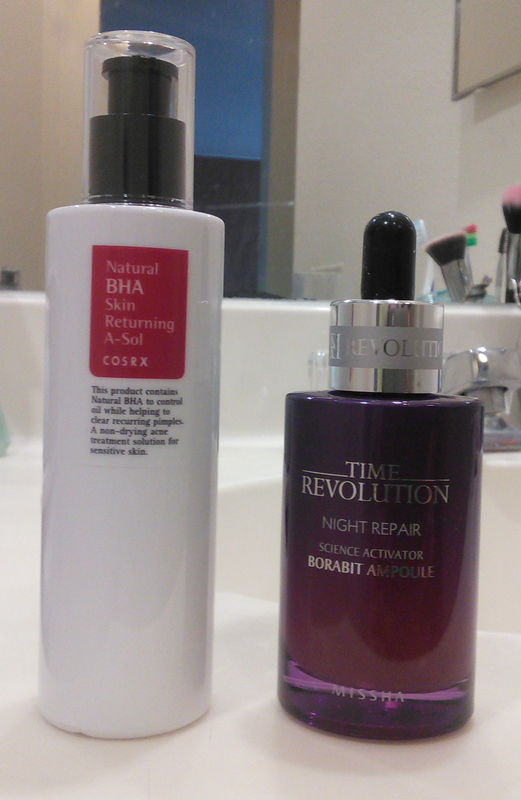 I’m so stoked to try out the CosRX Natural BHA Skin Returning A-Sol and the Missha Time Revolution Night Repair Science Activator Borabit Ampoule! The long wait for my package was a blessing in disguise, since I’m fresh out of Missha ampoule as of this morning and won’t have to wait to start my new one. The gods are good. A-Sol. Say it out loud, with a long “o.” Heh. What does it sound like? Heh heh. The rather unhelpfully named Natural BHA Skin Returning A-Sol is a pH-adjusting toner that promises to control oil, minimize the appearance of pores, balance skin, and treat breakouts; it can serve either as a spot treatment for “skin trouble” or as an allover preventative/maintenance step, which is how I plan to use it. This A-Sol appeals to me for a couple of reasons. One, the CosRX AHA 7 Whitehead Power Liquid is working great for me, and success with one of a company’s products always makes me curious to try out its other offerings. And two, the Returning A-Sol (hehehe) uses propolis extract instead of water as its base. Propolis is antibacterial, antifungal, antiviral, and anti-inflammatory. It’s also moisturizing, chock-full of antioxidants, and said to promote wound healing and cell renewal, giving it abundant potential as an anti-aging ingredient. This A-Sol is 60% propolis extract. In addition to all that propolis, the Returning A-Sol also contains AHA and BHA ingredients. The A-Sol’s pH is 4.3, too high for it to act as a chemical exfoliator, but it will lower skin pH to better prepare it for acids after cleansing, while the AHAs deliver an extra boost of humectant moisture and the BHA soothes inflammation. My primary expectations of this product are light hydration, redness reduction, and breakout prevention. The antioxidants are a nice plus. I’ve already squirted a little bit out of my A-Sol to see the texture. My A-Sol is watery with a lot of slip, like the AHA 7 Liquid, but smells herby and medicinal (thank God), rather than acrid and pungently evil like the AHA 7. I’ll be applying it after the Missha First Treatment Essence step in my morning and immediately after cleansing in my evening skin care routines. 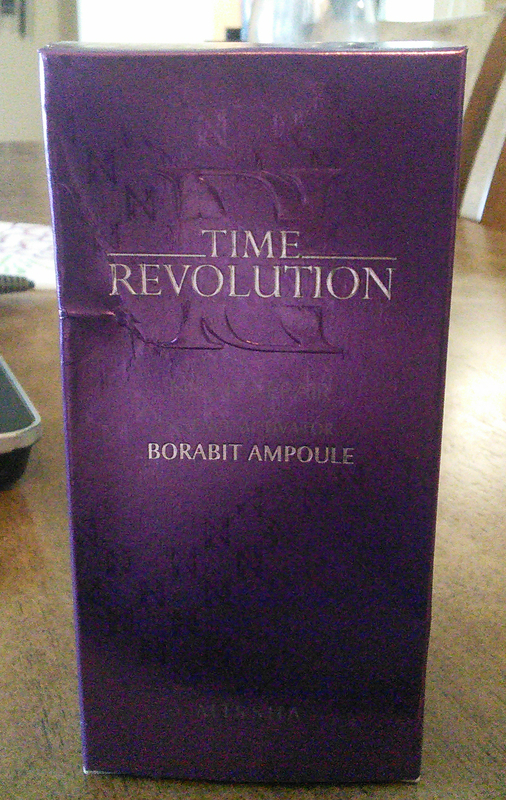 As exciting as my A-Sol is, however, it can’t compare to my sturdy purple bottle of Missha Time Revolution Night Repair Science Activator Borabit Ampoule in terms of star power. A reformulation of the much-loved anti-aging Missha Time Revolution Night Repair Science Activator “Long Name” Ampoule–which Skin and Tonics favorably compared to Estee Lauder’s Advanced Night Repair Serum–the Missha Time Revolution Night Repair Science Activator Borabit “Longer Name” Ampoule boasts new enhancements that may make it an even more powerful weapon in the war against sagginess, wrinkles, and stubborn sun spots. You can’t see most of the words in the name because Missha is absolutely terrible at designing readable packages. Seriously, I didn’t even bother taking pictures of the rest of the box, since the tiny tiny gray print is almost completely illegible even to my Lasik-enhanced 20/20 eyes and would come out even worse in a picture. I’ve just finished a bottle of the original Long Name Ampoule, which I liked immensely. In fact, I would have posted a positive review of it by now, except that I’d heard the news about Missha reformulating the product, as they also recently did with the First Treatment Essence. There’s no point reviewing a product that’s about to be made obsolete and unavailable for purchase, right? Unlike the FTE reformulation, however, the Longer Name Ampoule actually looks improved. Compared to the old Long Name Ampoule, the Longer Name Ampoule delivers significantly more retinol, a powerful wrinkle fighter, and adds several more antioxidant, anti-aging, and barrier-repairing actives, ferments, and extracts. All in all, the Missha Longer Name Ampoule looks to have some serious preventative and reparative potential for maturing skin types. I’ve got a great feeling about Missha’s Longer Name Ampoule. I’ll be applying it after my Benton Snail Bee High Content Essence in my morning and evening skin care routines. Now if you’ll excuse me, I can’t wait to get that A-Sol on my face. Have you tried either of these products yet? If so, what did you think? There are two different bottles of this, the 40ml and 50ml; one of them is pump and one of them is dropper. Don’t worry too much about counterfeits. From the reputable sellers recommended in the community, it’s not a problem! Do you apply the returning A sol before the aha or bha liquid? In the same routine?